Do you have questions about feeding geese, such as how to feed geese or how much do geese eat? We’ve got answers for all your feeding geese questions, including how to feed geese on pasture! The basics of feeding geese and goose feed are easy. After hatching and brooding goslings, your baby geese will need chick started and grower, as well as lots of water. Once your goslings approach adult geese size, the way you go about feeding your geese changes. Generally, feeding geese requires some level of improvisation. Your local feed store probably does not sell poultry feed formulated for feeding geese. Instead, you can feed your goslings chick starter feed (20% protein) intended for feeding chickens. When your geese mature (at or around three weeks of age), you can switch their geese feed to chicken grower pellet feed (16-20 percent protein). Besides feeding your geese chicken grower feed, you’ll also want to provide your geese with grit and grain scratch feed. In general, don’t feed your geese medicated poultry feed. Geese that are layer geese should be fed 200 grams of goose feed per day. When your geese are fully mature (around six weeks of age), you can move your geese to free-ranged pasture land to make use of their natural foraging feed ability. 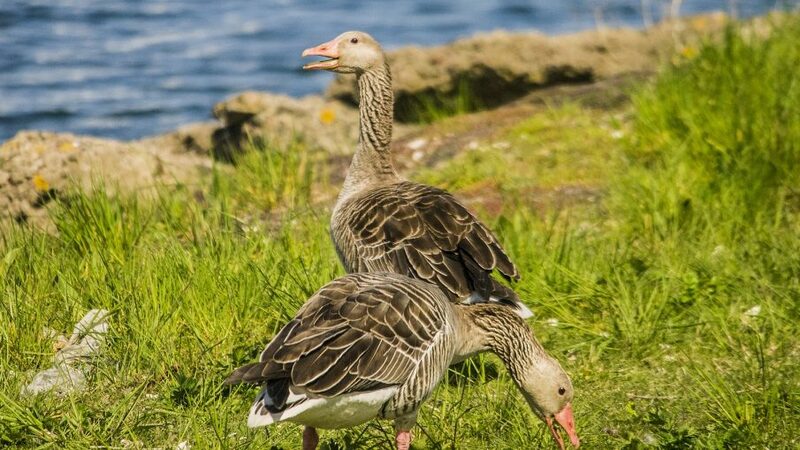 Not only are geese good at foraging for feed, but its also a natural and healthy goose diet. When they’re young, you can feed your geese garden and kitchen vegetable scraps and grass clippings from your lawn. Afterwards, transition your geese to a free-ranged pasture or fenced goose run. Geese like bluegrass, timothy grass, and other types of geese pasture grass. Never feed your geese on chemically-treated pasture land. How many geese can feed on a pasture? Generally, you can expect one acre of pasture to be sufficient feeding for up to 35 geese. Fence your goose pasture with a wire fence 3-4 feet tall. To provide your geese with shelter while pasture feeding, setup lean-tos wither strategically placed geese waterers. Geese are also great as weed control for gardens and specialized pastures. A Beginner’s Guide to Raising Geese: Start Raising Geese Today!